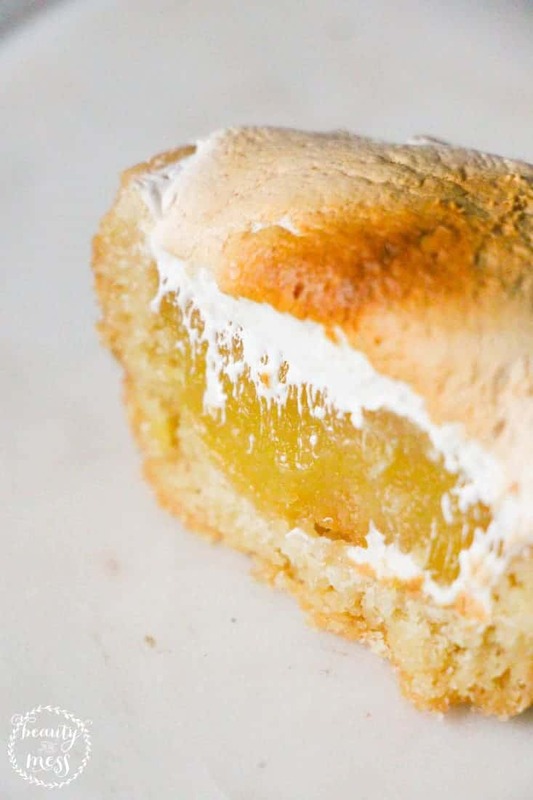 Do you love lemon meringue pie but find a whole slice is too much? 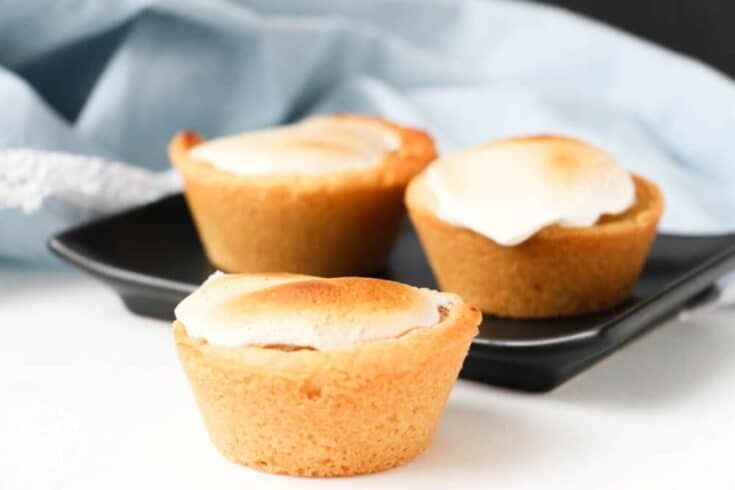 These easy mini lemon meringue pie cookie cups will be perfect! I’ve included both a gluten-free cookie recipe for the cookie cups and a non-gluten-free version. Make sure you look at the right recipe. 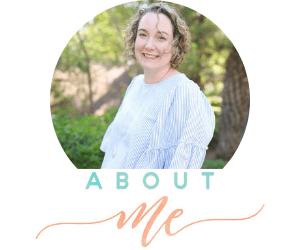 They are perfect for brunch, baby showers, individual desserts, birthday parties, holidays, and anytime you don’t want to eat a whole pie, and just want a taste. 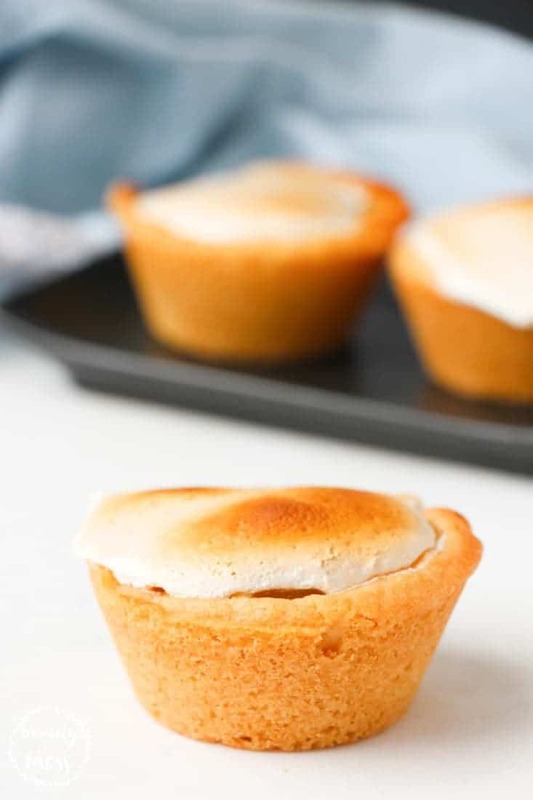 I kind of like to call the cheater lemon meringue mini-pies because there are so many baking hacks you can use. 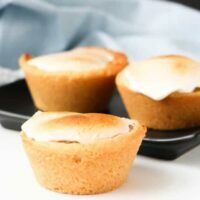 This recipe could easily be three-ingredient mini lemon meringue pies if you use a package of sugar cookie dough, store-bought lemon curd, and marshmallow fluff. How easy is that?! Enjoy! I can’t wait to hear what you think about these mini-treats. *NOTE: you can replace the lemon filling with store-bought lemon curd. In a medium saucepan, whisk together 1 cup sugar, flour, cornstarch, and salt. Stir in water and lemon juice. Cook over medium-high heat, stirring frequently until mixture comes to a boil. Stir in butter. Place egg yolks in a small bowl and gradually whisk in 1/2 cup of hot sugar mixture. Whisk egg yolk mixture back into remaining sugar mixture. Bring to a boil and continue to cook while stirring constantly until thick. Remove from heat. Grease a muffin or tart tin and press 1-2 Tablespoons of cookie dough into each indentation and press to shape into a cup shape (start along the bottom and sides of the indentation). Bake the cookie cups for 8-12 minutes (will vary depending on the size of your tin). Fill each cookie cup with 1-2 Tablespoons of the lemon filling. Then top with a Tablespoon of marshmallow fluff. Place all of the cookie cups under the broiler for 2 minutes, or until the marshmallow topping appears golden. Thank you for making a gluten free version! It looks delicious! I just recently found out about marshmallow fluff. It seems like such a funny thing to buy in a jar.